For over 100 years, Atlas instruments have revolutionized the science of weather durability testing. The new Atlas Ci4400 Weather-Ometer® is our most advanced instrument yet providing easy and effortless operation, unmatched uniformity, increased capacity and a sleeker design, delivering unparalleled value and performance. With its user-friendly touch screen interface and ergonomic features, the best-in-class just got even better. Design and engineering innovations in the airflow, irradiance and control systems have dramatically reduced variability in critical test parameters. 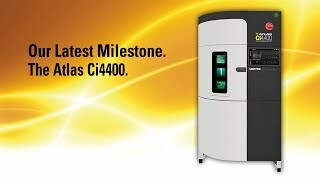 As a result, the Ci4400 achieves new levels of temperature, humidity and light exposure uniformity.